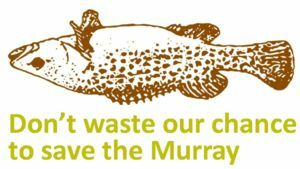 The draft Murray Darling Basin Plan could save the Murray. But it doesn't take into account climate change. The mighty Murray - and the rivers that flow into it - have been teetering on the brink of collapse. Now there’s a national plan to turn things around for our rivers – the Murray-Darling Basin Plan. But instead of looking after our rivers for the long term, the draft Basin Plan is heavily compromised and doesn't even take into account the future impact of climate change. The good news is that the draft plan is only a draft, and you can help change it. Writing to your local politician and tell them what you think. There's a template at here. This page was last modified 02:22, 20 February 2012.